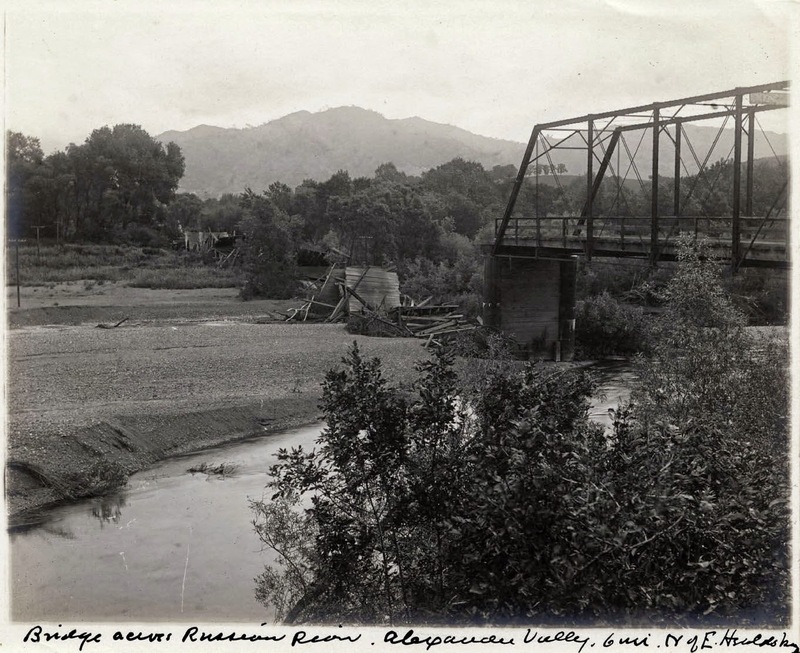 The Alexander Valley Road Bridge was built in 1949 by the Judson Pacific Murphy Company, who built many other big bridges in Clifornia. A through truss bridge was originally at this location (see photo below). Several spans collapsed during the 1906 San Francisco earthquake (see photo below) but new spans were put on the piers and they continued to use the bridge until the current bridge was built according the Historic Bridges Website. The current bridge is 1384 ft long and includes five truss main spans as well as thirty approach spans that include haunched T girder spans and slab bridge spans on the east side of the Russian River. This makes it the second longest bridge in Sonoma County. Sonoma County, California Bridges: Alexander Valley Road Bridge across the Russian River (2) by Mark Yashinsky is licensed under a Creative Commons Attribution-NonCommercial-NoDerivatives 4.0 International License.